Single gauge for even filling and exhausting of both air bags. Air adjustability right from the dash of your vehicle, up to 100 PSI for maximum roll stability. Control The Pressure For Any Air Lift System From Your Dash! 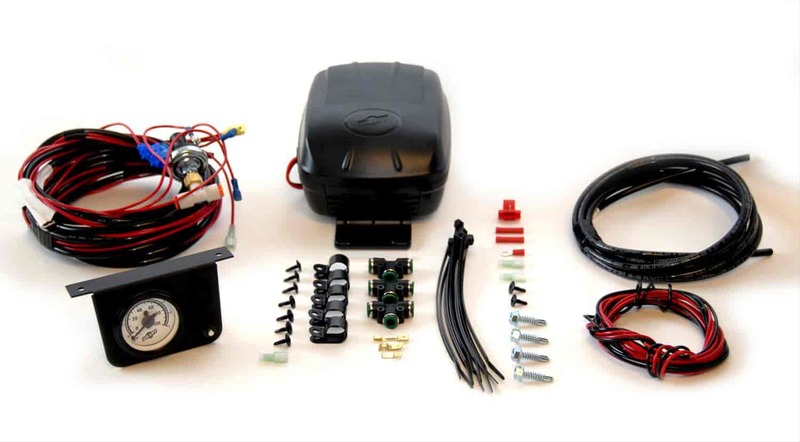 Each kit is complete with a 12-volt compressor, gauge dash panel with inflate and deflate controls, all electrical connections, air lines, fittings, low pressure sensor (some models), and a detailed, illustrated installation manual. Load Controller II systems are economically priced for less demanding applications, such as the occasional and light duty haulers and towers. To assist in kit longevity, a Low Pressure Sensor is included in some kits to assure that minimum pressure is maintained with or without a load. Does Air Lift 25592 fit your vehicle? 25592 is rated 5.0 out of 5 by 1. Rated 5 out of 5 by DinoH from Air Lift Compressor and Air Springs Installed on my F450 to help with my 53 foot racing trailer. Fit was excellent and I am able to level my truck with a BIG load on it. Great product!! !